“Heart Whispers” from Christian Faith Publishing author Larrie E. Gale, Ph.D. is the story of Marc and Amala. Struggling with the bigotry of friends and families from two very different worlds, the couple struggles with their forbidden love and the consequences of the painful decisions they must make. 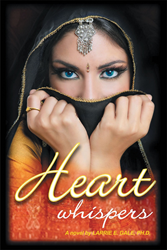 “Heart Whispers”: Marc and Amala’s struggle to bridge their two worlds and build a lasting love. “Heart Whispers” is the creation of published author, Larrie E. Gale, Ph.D., a retired faculty member of Brigham Young University. His career involved video production, instructional design, research, and interactive media. He has designed, written, and produced seventeen major interactive multimedia projects and worked on a number of minor ones. His clients included Ford, McDonnell-Douglas, Aramco, the BBC of both London and Japan, the Air Force, the Army, CMC of India, WAVES of Denmark, AIMS of Norway, the Israeli Ministry of Education, FLEXIS of Singapore, the Sheika of Qatar, and others. Some of his nationally and internationally broadcast radio and television programs won bronze and silver Telly Awards. Larrie is married to Manuela (Nell) Velasco, and they are the parents of six children and grandparents to twenty-four grandchildren. He also served five years as a lay minister in his church. “Each is powerfully attracted to the other, but can their differences be merged into strengths through commitment to each other and to shared Christian values? Can parents change their feelings and views of the world to support them? Is it possible that a happy family can be created by two individuals from such diversity?” --Larrie E. Gale, Ph.D. Published by Christian Faith Publishing, Larrie E. Gale, Ph.D.’s new book tells the story of a forbidden love. Marc is from the United States. Amala is from India. When Marc meets Amala, he immediately falls for her. They are both powerfully attracted to each other, but their differences must merge into strengths through commitment and their mutual Christian values. They must overcome resistance from their parents, whose feelings and worldviews blind their hearts to the love Marc and Amala share. Enduring the emotional roller coaster of a forbidden romance, Marc and Amala must carefully consider the consequences of their choices, which are sure to end with pain. View a synopsis of “Heart Whispers” on YouTube. Consumers can purchase “Heart Whispers” at traditional brick & mortar bookstores, or online at Amazon.com, Apple iTunes store, Kobo or Barnes and Noble. For additional information or inquiries about “Heart Whispers,” contact the Christian Faith Publishing media department at 866-554-0919.